I have been telling my husband that we need to get into the holiday spirit so that we can let our girls have fun childhood memories. So we looked into an egg hunt at the Rose Bowl and planned out the logistics and said we were going to go.... And didn't. 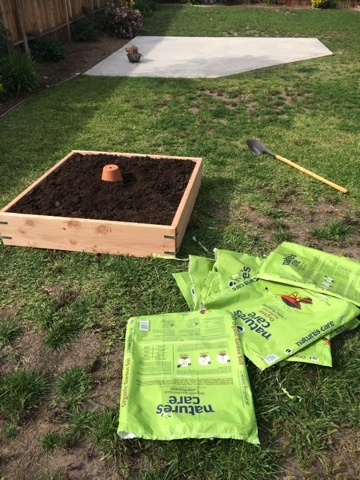 We instead built a raised bed and started planting some veggies to teach our kids how to be "close to the earth" and to help cut down on grocery expenses in the near future. 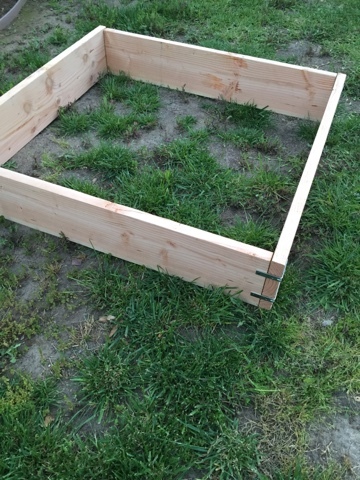 This is the raised bed we built. I bought the wood scraps from Home Depot for 50% off for a total of less than $5. There are 4 2x10x4' fir boards. The first raised beds I ever built were a little more complex. 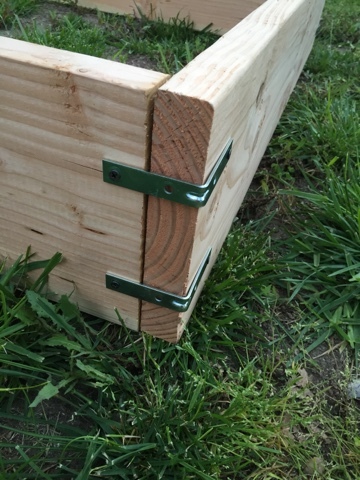 This raised bed is held together with 8 3" brackets, 2 on each corner, and 1" drywall screws. 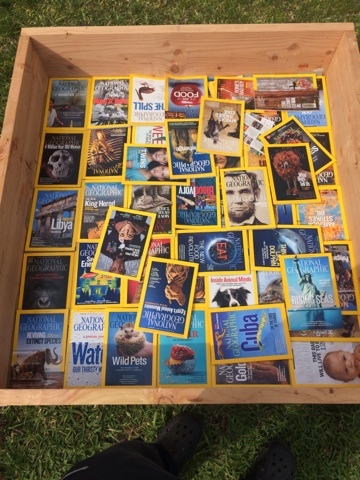 It really seems like such travesty for an English Major like me to use these National Geographic magazines but they were just sitting around for years, gathering dust and cat hairs and growing those disgusting little silvery bugs. 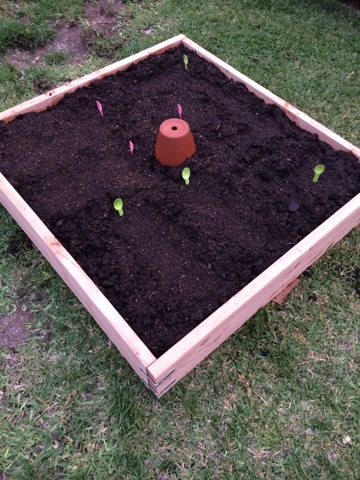 So I saw this thing on Pinterest where they suggested we use cardboard under the soil to kill the grass. We just subbed it with the magazines. I hope it'll work just as well. We centered this clay pot contraption (there's an Arabic name for it but I don't remember what it is) that my husband's cousin gave us. It's a water reservoir that will allow the water to seep out into the soil. Then filled soil around it. We planted Swiss chard, kale, radishes, tomato, and watermelon in here. I know Pinterest has lots of ideas for marking what you planted but we had Yogurtland spoons lying around so why not? Today, just 4 days after doing all this, the radishes have sprouted! Awesome! Now to look up radish recipes. My biggest lessons learned: my kids will have just as great of a time being kids as their friends and not everything has to be Pinterest-perfect.